My wife received “Rowdy” by Christopher Madsen for review as a fan of memoirs, World War I and WWII, but being an Adriatic Sea creature from the ports of Bari-Italy I snatched it for myself, and I am glad I did. The book begins with Madsen’s own story and the beginning of his relationship with the sea, which was seeded by his own father. After the loss of his wife, it is that relationship and love for sailing that helped him through his grief and to start a new life within the world of sailing. One day he receives a phone call from a boat restorer and seller, and that is when he discovers the 1916 yacht “Rowdy.” It is at this point in the book that the reader will sail through time into history through the life of this exceptional boat’s first owner. Christopher Madsen’s research will not only unravel a personal account of World War I through Holland Duell’s journal, it will also enrich his own life through a priceless sea jewel and its roots as he meets its long lost family. Madsen’s research is impeccable. I can’t imagine the amount of time invested in restoring the boat and uncovering its story. He was not only successful in both goals he had set for himself, he went even further by creating this beautiful collection of journals, pictures and his own life accounts. This well written book will captivate the reader to travel within its pages and pictures into the second decade of the 1900’s, through time, and all the way to the re-birth of “Rowdy.” This book is not just about the boat. These pages are also an homage of Madsen’s love for sailing and his relationship with the sea. 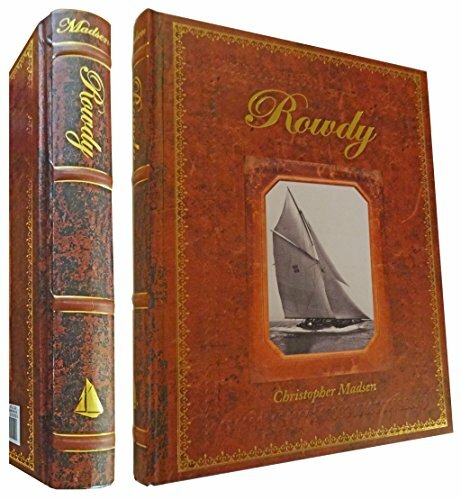 If you haven’t guessed it yet, I truly enjoyed “Rowdy” by Christopher Madsen and recommend it as a five-star read for history and sailing lovers alike. It is a wonderful gift for anyone’s book collection and a wonderful couch traveling adventure to come back to on a relaxing weekend afternoon!